The HMC890/1/2A series are monolithic microwave integrated circuit (MMIC), band-pass filters that features a user selectable pass-band frequency. 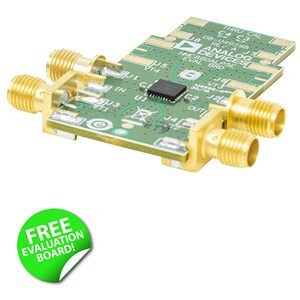 The 3 devices in the series allow users to select centre frequencies between 1.0 GHz and 6.25 GHz by applying an analog tuning voltage between 0 V and 14 V.
The HMC890A series 3 dB filter bandwidth is approximately 10%. The ≥20 dB filter bandwidth is approximately 30%. The centre frequency can vary between 1.0 GHz and 1.9 GHz by applying an analog tuning voltage between 0 V and 14 V.
The HMC891A series 3 dB filter bandwidth is approximately 9% and the 20 dB filter bandwidth is approximately 23%. The centre frequency can be varied between 1.95 GHz and 3.4 GHz by applying an analog tune voltage between 0 V and 14 V.
The HMC892A series 3 dB filter bandwidth is approximately 8.7%. The 20 dB filter bandwidth is approximately 23.8%. The centre frequency can be varied between 3.45 GHz and 6.25 GHz by applying an analog tuning voltage between 0 V and 14 V.
The HMC890/1/2A series of tuneable filters can be used as a smaller alternative to physically large switched filter banks and cavity tuned filters. They have excellent microphonics due to the monolithic design, and provide a dynamically adjustable solution in advanced communications applications. The devices are supported by Evaluation boards to allow engineers to accelerate their designs to market, each device has a specific evaluation board. Anglia are offering customers a FREE evaluation board for the HMC890/1/2A series of tuneable filters from Analog Devices, please fill in the form below to register for your FREE samples now.